Items 218- out of displayed. 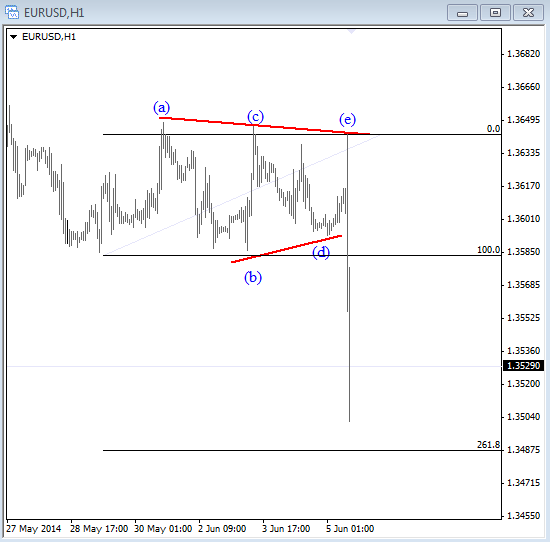 EURUSD broke lower today, from a triangle that usually occurs in position prior to the final of one larger degree. So the question is if the support is near!? Pair could go much lower, no doubt, but because of the pattern we see here it may not be a bad idea to stay aside, and wait on pullback. The easy money on the short side is already behind now, so focus on new set-up rather than selling it at current levels may not be a bad idea. 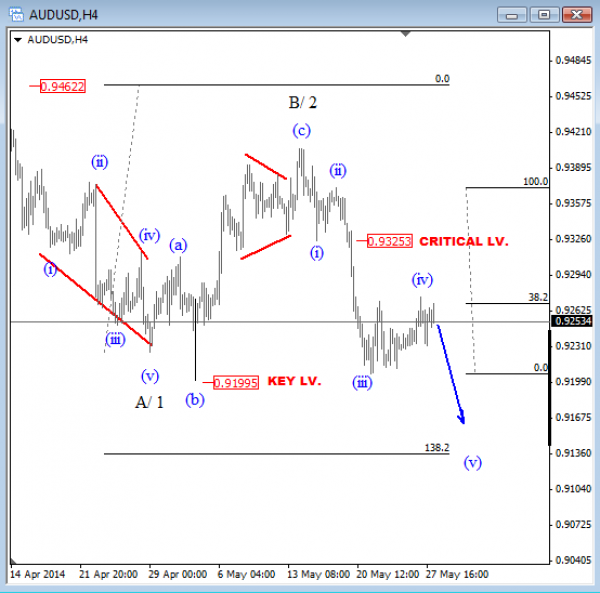 AUDUSD has turned to the downside last week, and found some support just few pips away from 0.9200. We however think that pair is going to reach even lower levels especially because of sharp decline from around 0.9380 that has personality of a wave three as part of an impulse. With that said, a decline from wave B/2 high is most likely a new five wave cycle that may send prices down to around 0.9130-0.9160 in the next couple of days. 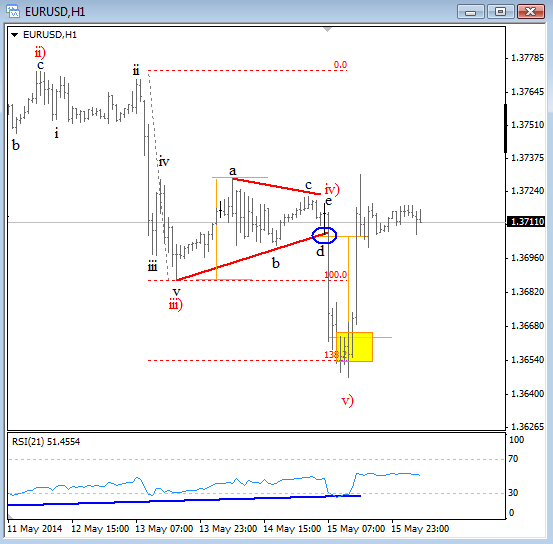 At the moment we see slow intraday recovery that looks like a wave four so be aware of a break down into wave (v). US Treasuries are trading higher for the last few weeks, so yields are obviously declining which caused limited gains on stock market that also turned down last week, with S&P reversing from 1900 psychological level. 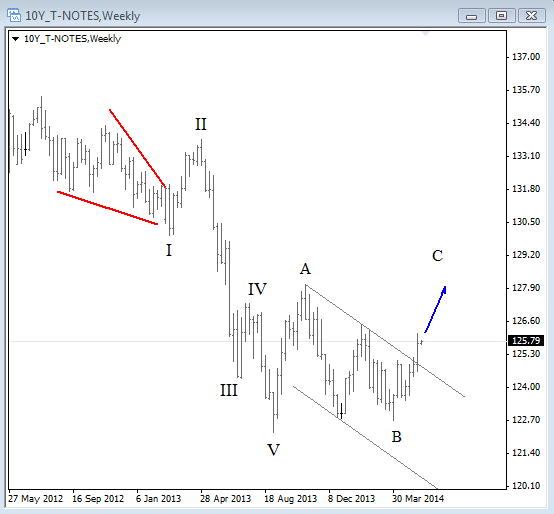 Below we have a weekly chart of 10 Year US notes where we see a three wave rally in progress. Ideally market is now in wave C heading much higher which means that S&P could fall much more in the next couple of days. At the same time we also observing a corrective price action on the S&P500 that appears incomplete as price turned back into natural zone, most likely into just another but larger corrective pause within big ongoing uptrend. 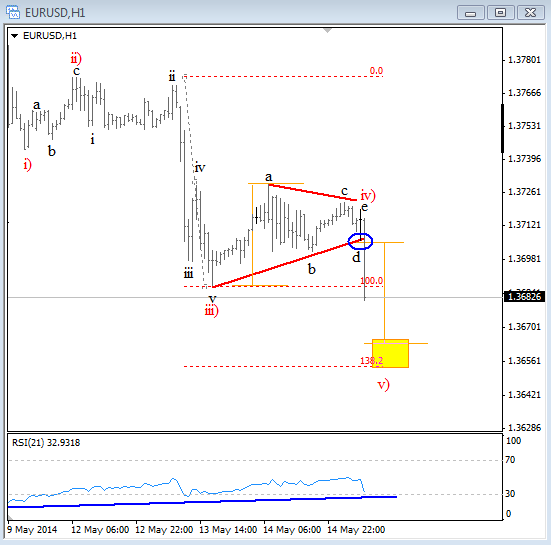 How we identified a short-term reversal/suppport zone on EURUSD after sharp drop of more than 300 pips!? US stocks were firstly trading higher after better than expected NFP but then we have seen a pullback into the Friday's close on tensions in Ukraine. US yields also feel sharply following the NFP which is also causing a downside pressure on stocks. Below we have a chart of 10 year US yields where we can see that price close out side of the 3-month range that could lead to lower prices in May. 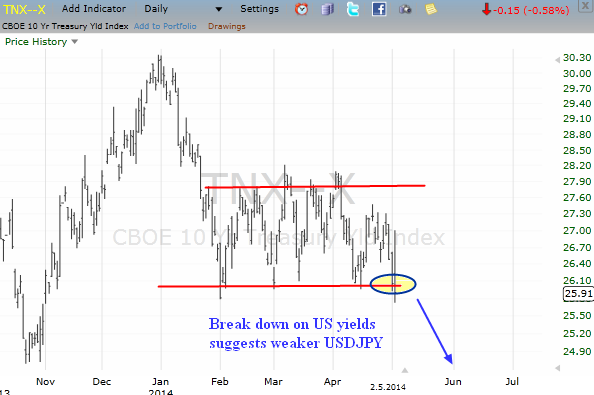 If yields will continue to the downside then stocks and especially the USDJPY will be moving south as well. 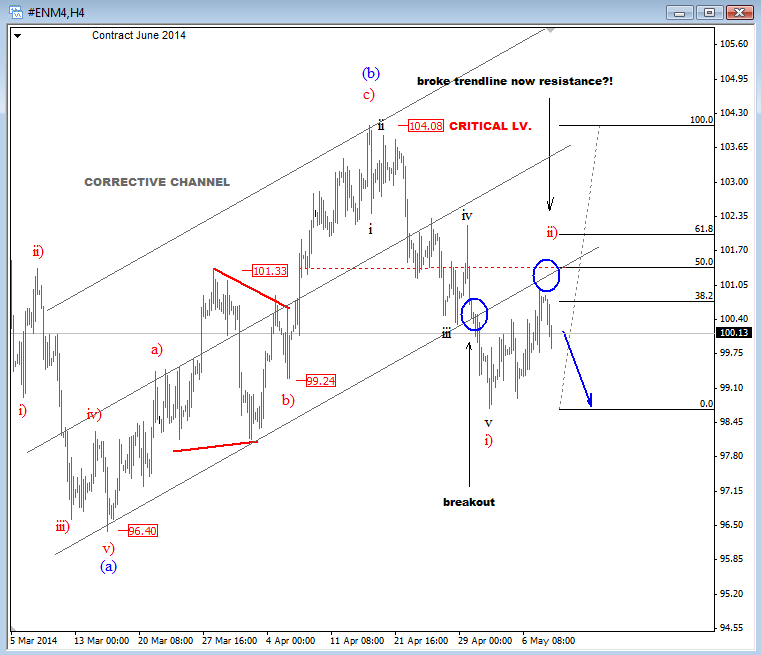 In fact, we were looking for a bearish reversal from 103.00 on USDJPY and we got it on Friday. 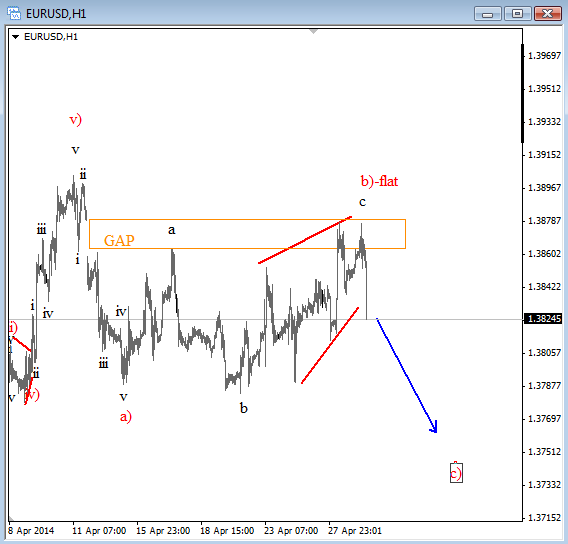 In fact a reversal is looking strong so ideally it’s start of a larger decline. 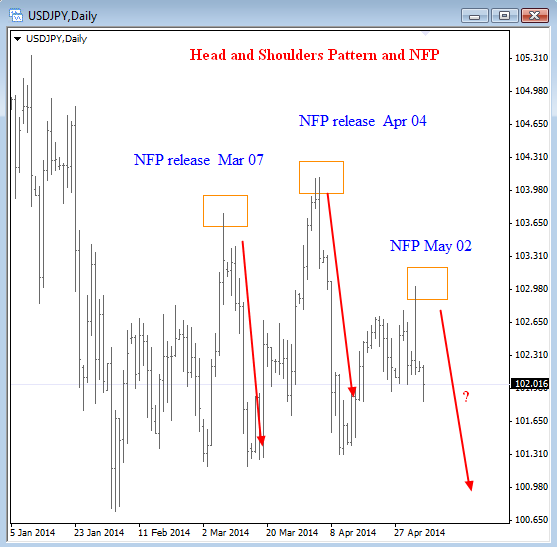 Very interesting is also a comparison of USDJPY waves to the reaction following the NFP back from March and April when pair fell sharply, so we would not be surprised to see something similar now at the start of May. 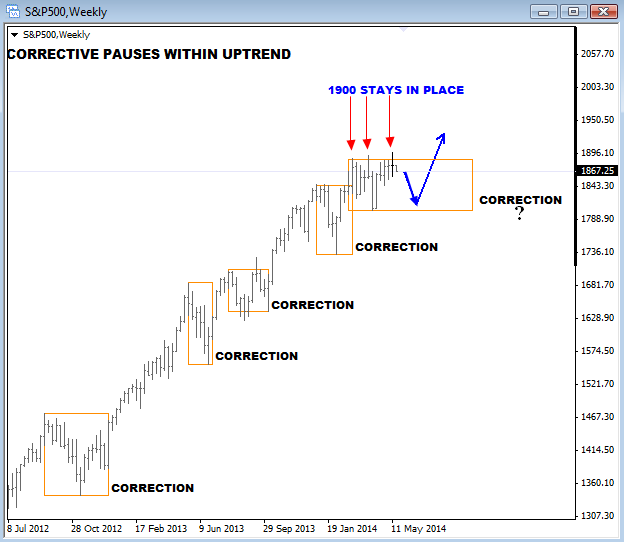 A bearish head and shoulders pattern is suggesting the same. We are tracking this pair very closely for EPO. EURUSD is turning down from the "GAP Zone" after release of softer than forecast Germany inflation data. There is room for more weakness and test of 1.3784. It looks like price will remains sideways for a few more days.